Last month, Disney (DIS) CEO Bob Iger announced that its streaming service will be called Disney+ and that it will be launched around the end of next year. 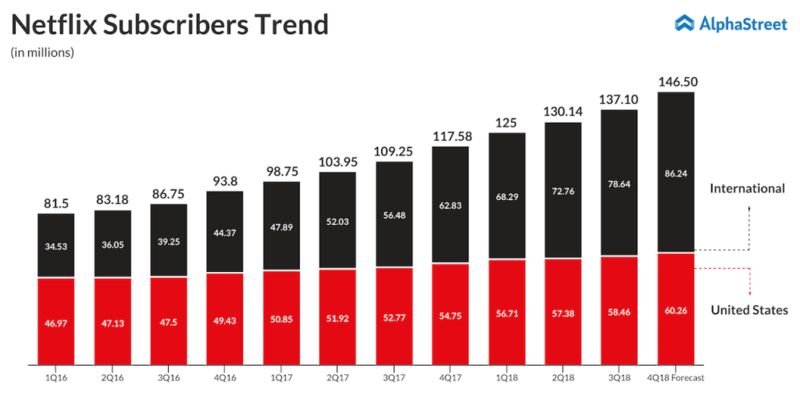 And even a year ahead of its launch, the new player in the video streaming industry is looking like a formidable rival to Netflix (NFLX). Apparently, Ted Sarandos doesn’t think so. The Chief Content Officer of Netflix recently stated that he was not worried about Disney’s entry as the industry is big enough to carry multiple streaming giants. “There is plenty of room,” he said, adding that he believes Disney will be able to produce some successful content. However, one must remember, unlike Netflix, Disney has a long history in the media and entertainment sector and has forged numerous partnerships – including Pixar, Marvel and more recently, Fox – all of which presents a wide range of already popular content. With an array of marketable characters already in its fold, all Disney needs to do is place them in storylines that are on par with Netflix content. Moreover, in what could turn out to be an advantage for Disney, Netflix recently pulled out three Marvel shows –Iron Fist, Luke Cage and Daredevil – over disagreements regarding their profitability. Though Marvel is a unit of Disney, license to produce these shows were awarded to Netflix earlier. The axe on Daredevil after three seasons comes as a rude shock to binge-watchers as the show has already gained a lot of fan-following. The two remaining Marvel series on Netflix – Jessica Jones and The Punisher – are likely to face a similar fate. Marvel fans are furious over Netflix’s decision to abandon their favorite characters, and it is likely that Disney may take advantage of this situation. While initially Disney+ is expected to struggle in terms of content volume compared to Netflix, Iger had earlier stated that its pricing would remain modest till they have a considerable amount of shows on the site. It may be noted that the company’s theatrical releases, beginning Captain Marvel, will be available on its streaming platform. If Marvel fans flock into Disney+, it’s only a matter of time, before the new streaming company catches up with Netflix. Meanwhile, Netflix is focusing on further east. It is currently planning to create pure African content next year, featuring African actors speaking their language in their setting. The company has also been tasting success in a high-growth potential Indian market. Even as Netflix tests new waters, it has become more important than ever before, that it secures its domestic market with interesting content. Unlike its other rivals, including Amazon (AMZN) Prime Video and Hulu, Disney has the ability and talent to trump Netflix in a shorter span. At the end of the day, there may be room in the industry only for winners. Follow our Google News edition to get the latest stock market, earnings, and financial news at your fingertips.